The Research Experiences for High School Teachers Conference will take place on June 27, 2014. Apply now and receive a stipend for participation. Develop your knowledge of engineering, engineering careers, and “Wood-to-Wheels” (W2W) biofuels. Learn more at Current Institutes, Department of Cognitive and Learning Sciences. Brad Baltensperger, chair of the Department of Cognitive and Learning Sciences and professor of geography, is retiring after 40 years at Michigan Tech. The campus community is invited to attend his retirement party on Wednesday, April 30, from 3:30 to 5:30 p.m., in Memorial Union Ballroom A2. Please join the department in celebrating his career and wishing him an enjoyable retirement. Refreshments will be provided! Last Friday, dozens of students, faculty and other members of the Michigan Tech community celebrated students’ achievements at the 20th Annual Student Leadership Awards. Les Cook, vice president for student affairs and advancement, and Hannah Altscheffel, Tech’s 2013 Rising Star of the Year, hosted the ceremony. The ceremony concluded with the recognition of a few other award winners, including Patrick Belling, who received Exceptional Graduate Student Leader. Read more at Tech Today, by Monica Lester. 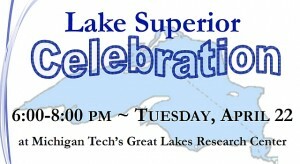 The community is invited to the Lake Superior Celebration at the Great Lakes Research Center. The event, hosted by the Lake Superior Stewardship Initiative (LSSI), is FREE, family-friendly, and open to all. Learn more at the Western Upper Peninsula Center for Science, Mathematics and Environmental Education (WUP Center). A new PBS video will be aired at the celebration. It features local participants in the Great Lakes Stewardship Initiative. The event is free and open to the public and all are welcome. 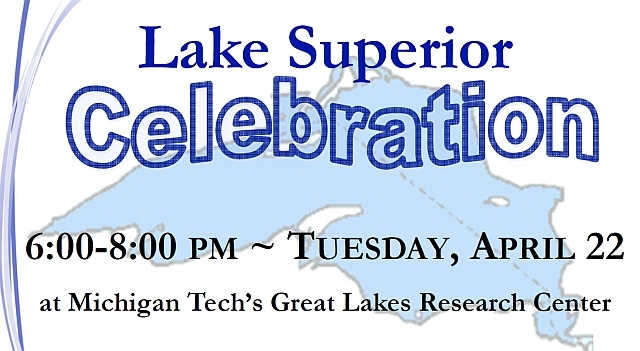 The Lake Superior Celebration is sponsored by the Lake Superior Stewardship Initiative and Michigan Tech’s Western UP Center for Science, Mathematics and Environmental Education. Earth Day was started in 1970 to help raise awareness, channeling the energy of the anti-Vietnam War protest movement to help bring environmental issues to the forefront. Senator Gaylord Nelson from Wisconsin was inspired to establish Earth Day after witnessing the aftermath of the massive oil spill in Santa Barbara, California, in 1969. Read more at Tech Today, by Erika Vichcales. Joan Chadde was in Detroit recently leading field trips to the forests of Belle Isle for 350 Detroit students (grades 5-9) from nine Detroit Public Schools as part of the Urban Forest Stewardship Project and a forestry teacher workshop. Both were funded with an $80,000 grant from the US Forest Service to provide teacher training and increase middle/high schools students’ knowledge, stewardship and interest in natural resource careers. There is an opportunity for people who have participated in a Michigan Department of Education grant previously to join the cohort of 19 teachers who are participants in the grant. The Educators’ Professional Development Institute Series (EPDIS): Engineering, Life Sciences and NGSS is focused to support and deepen teacher content knowledge and content pedagogy of practicing teachers. View the Application, Brochure, Schedule, and Contact information at the Current Institute page of Teacher Professional Development in the Department of Cognitive and Learning Sciences. Complete ENG 5400 course & 3DPrinter workshop. Submit all pre/post evaluations for yourself and evidence of project related student learning. Assist in all components of program evaluation and assessment, including SAMPI Classroom Observations. James Alexander, PhD student in Applied Cognitive Science and Human Factors, was profiled in the Research section of the Michigan Tech Graduate School Annual Report 2013 regarding developing diverse areas of expertise. 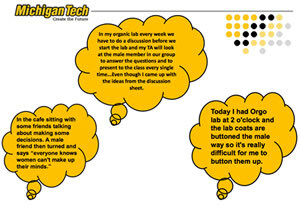 Representatives from Michigan Tech attended the “Equity Within the Classroom Conference” hosted by University of Michigan, Ann Arbor, recently.